“Dem bones dem bones dem dancing bones..” Boy, that song has been stuck in my head all day. 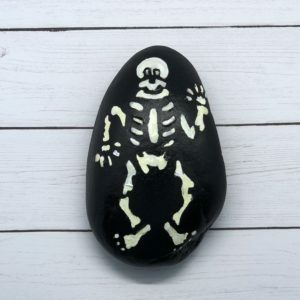 My kids and I needed some rock painting inspiration so we turned on some festive Halloween tunes. 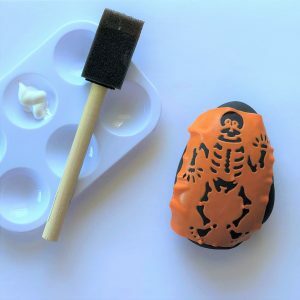 Here’s a super easy Halloween Skeleton Rock Painting tutorial using stencils. 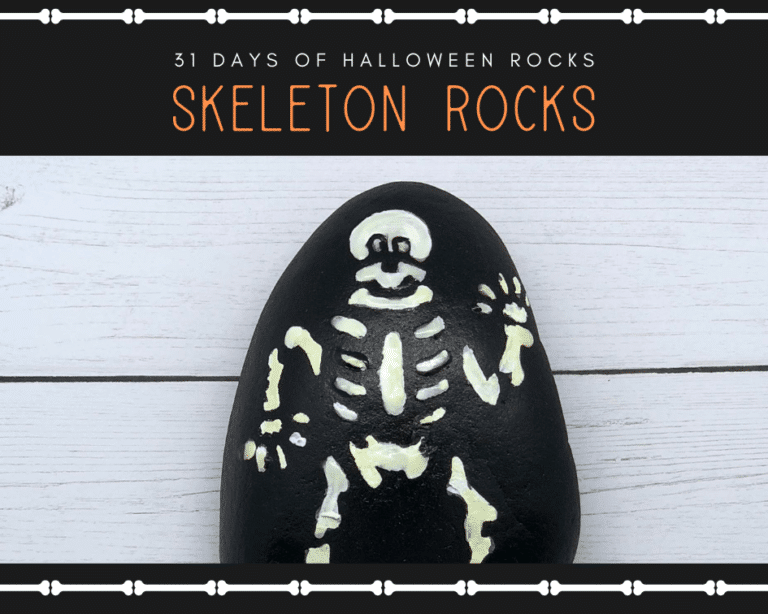 This bone-chilling rock painting craft is a part of another post called, 31 Days of Halloween Rocks, check it out for more boo-tiful rock painting ideas. 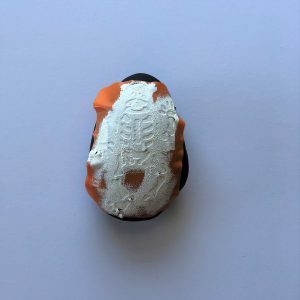 Start by searching in your own backyard for rocks to paint. Public areas such as parks and hiking trails are great places to find rocks as well. Begin by painting a base coat of Black craft paint on the rock and let it dry before moving on to the next step. Place your stencil in the desired area on your rock. Depending on the backing of the stencil you make need to tape it down. I used a stencil that had a cling on backing so it affixed to the rock. Apply the Glow-in-the-dark paint using a foam brush with a dabbing motion. Once you’re done, remove the stencil carefully and let it dry completely. Wipe the stencil with a damp paper towel on both sides before using again. Spray a clear sealer on the rocks and let it dry again for 24 hours before touching the rocks. Here’s a link to the Skeleton Dance video, if you need some inspiration too! 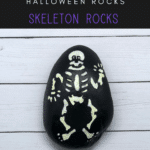 Have you made your own Halloween Skeleton rock painting?